Funny and totally true childhood biographies and full-color illustrations tell the tales from the challenging yet defining growing-up years of J. K. Rowling, Beverly Cleary, J. R. R. Tolkien, and 12 other great writers. Every great author started out as a kid. Before the best sellers, fan clubs, and beloved stories we know today, the world's most celebrated writers had regular-kid problems just like you. Sam Clemens (aka Mark Twain) loved to skip school and make mischief, with his best friend Tom, of course! A young J. R. R. Tolkien was bitten by a huge tarantula—or as he called it, “a spider as big as a dragon.” Toddler Zora Neale Hurston took her first steps when a wild hog entered her house and started chasing her! 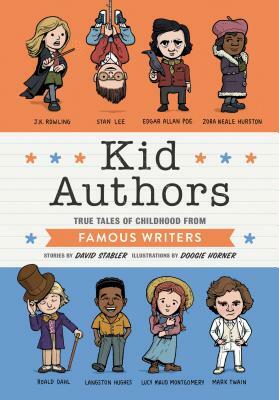 Kid Authors tells their stories and more—the diverse and inclusive cast that includes Roald Dahl, Beverly Cleary, J. K. Rowling, Jules Verne, Lewis Carroll, Stan Lee—through kid-friendly texts and full-color cartoon illustrations on nearly every page. Author David Stabler and illustrator Doogie Horner have created several books together, including Kid Presidents (Quirk, 2014), Kid Athletes (Quirk, 2015), Kid Artists (Quirk, 2016), and Kid Authors (Quirk, 2017).